I’m not a picky eater and I’m certainly not a princess. I enjoy, no, I obsess over food. There’s nothing I love more than being excited by a dish, inspired by its execution and aroused by its flavour. I have a passion for good food, whether its served by a suited server on a wiped, white plate or unwrapped from greasy paper delivered between two beautiful buns. When it comes to French food, however, I have a bit of a benchmark. As France is arguably revered as the gastronomic haven of the world, there’s something about eating French cuisine that has my secret, miniature magnifying glass up. You just pictured me inspecting a plate of snails with a miniature magnifying glass, didn’t you? I crave authenticity when it comes to consuming the food of France and that isn’t always easily met when dining outside the land of pastry and fromage. When I was invited last week to review La Brasserie nestled in Chelsea, you better believe I snuck in my spy kit. I entered off the chilly London streets and was greeted by not only my lovely friend whom had invited me along, but a warm, bustling brasserie which transported me instantly back to Paris. I tend to find brasseries in London and father afield feel staged and almost tacky in their efforts to exude a French feeling. La Brasserie, however, encapsulates authenticitié with its checkered floor, red leather seating and amber glow from the lighting overhead. It was lunchtime and the restaurant was filled with diners enjoying brunch whilst reading their papers, conducting business meetings over pâté or having a catch up with flowing bubbles. As we nibbled on baguette and pale, creamy butter I struggled through the menu trying to decide what to eat. 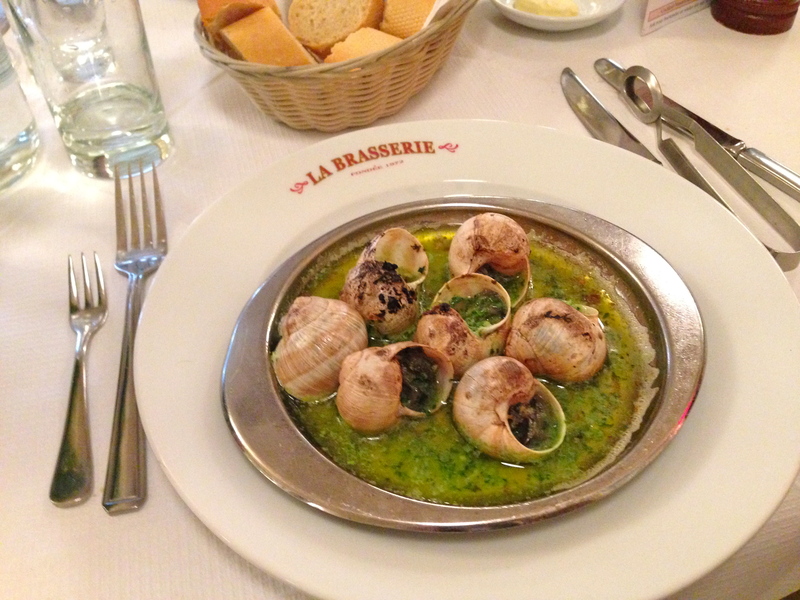 I eventually decided to indulge in an entirely Parisienne affair, beginning of course with escargot. They arrived swimming in the classic combination of garlic, butter and parsley. Although they could have been a little hotter in temperature, they were cooked perfectly. After scooping them all out skilfully using my escargot tongs (I always picture an escapee slipping and sailing across the dining room) I couldn’t resist drowning pieces of baguette to consume the rest of the heavenly sauce. 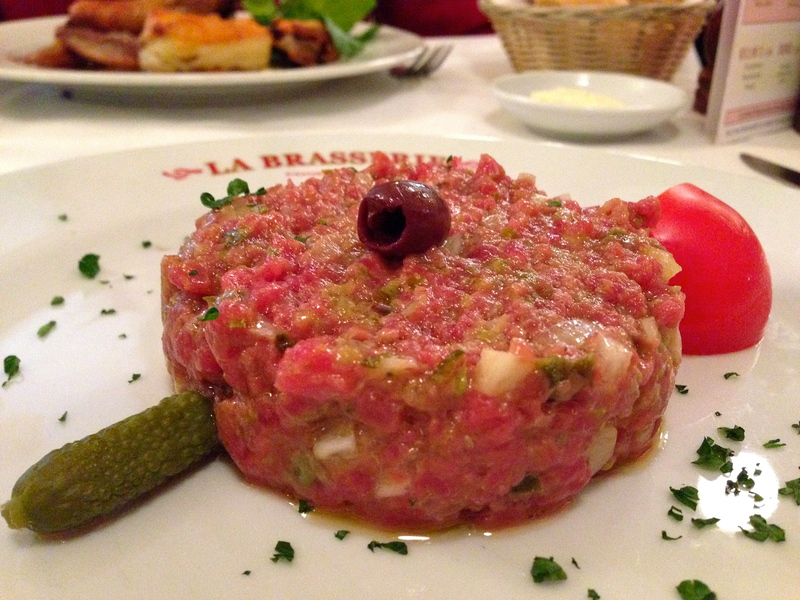 Despite the miserable weather, I chose the steak tartare for my main. It was tangy and flavoursome with nice crunches of onion. The frites served with this could’ve also been a bit warmer, but were the perfect combination of crispy and soft. Throughout lunch, I watched as the staff not only treated me with warm, welcoming hospitality, but were equally attentive with all diners. Everyone seemed to be thoroughly enjoying themselves, whether their purpose be relaxing or socialising, and believe me, plenty of the latter was going on. Lovely locals and repeat customers tend to bump into each other here and just before dessert arrived, we had a few join us and began sharing endless, engaging stories. To satiate my sweet tooth and continue our Parisienne journey, we shared a lemon tart with plum and blueberry compote. This had been blowtorched for a nice crunchy exterior guarding the creamy lemon curd underneath. 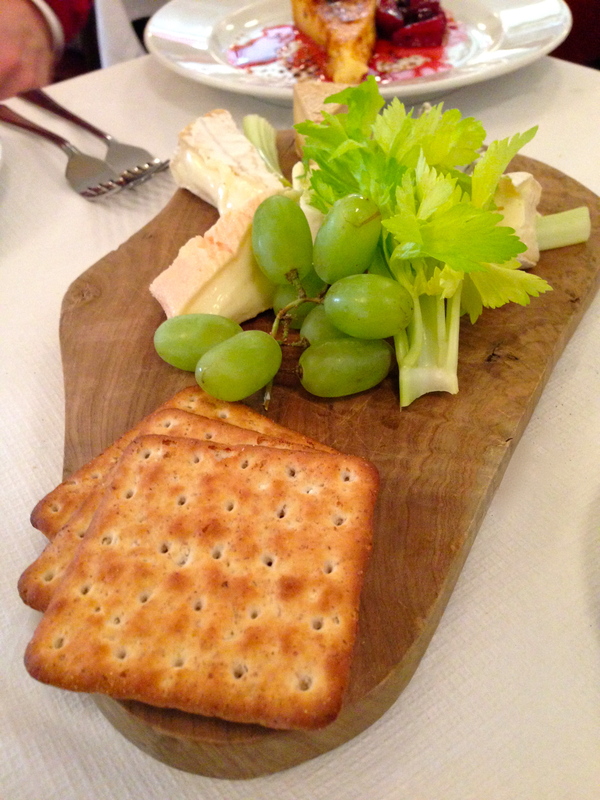 As no French meal is complete without cheese, we shared a board of very strong cheeses. Ignoring a few bad grapes, I happily slathered the cheese onto our remaining baguette whilst hearing more stories from our new dining companions. 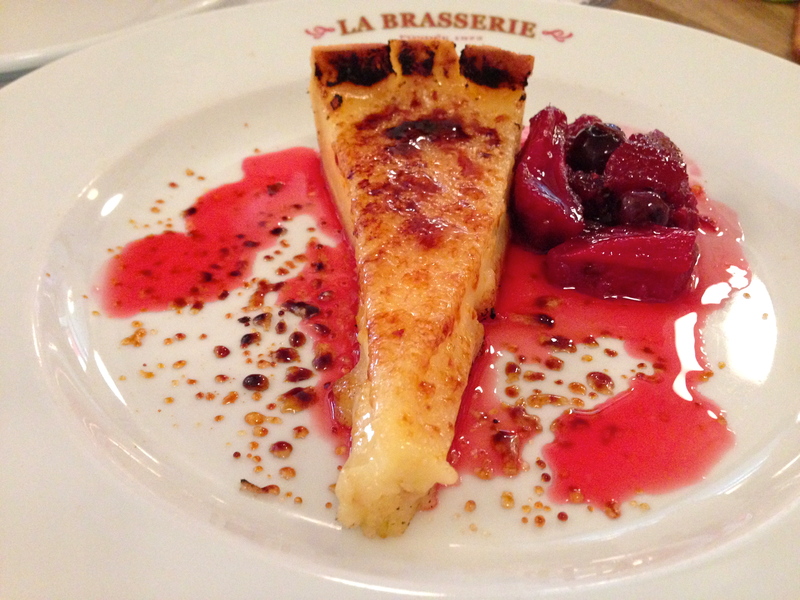 La Brasserie is well worth a visit for an afternoon of fine French food, welcoming hospitality and enjoyable atmosphere. They take bookings online and even do an Afternoon Tea which I may need to test. 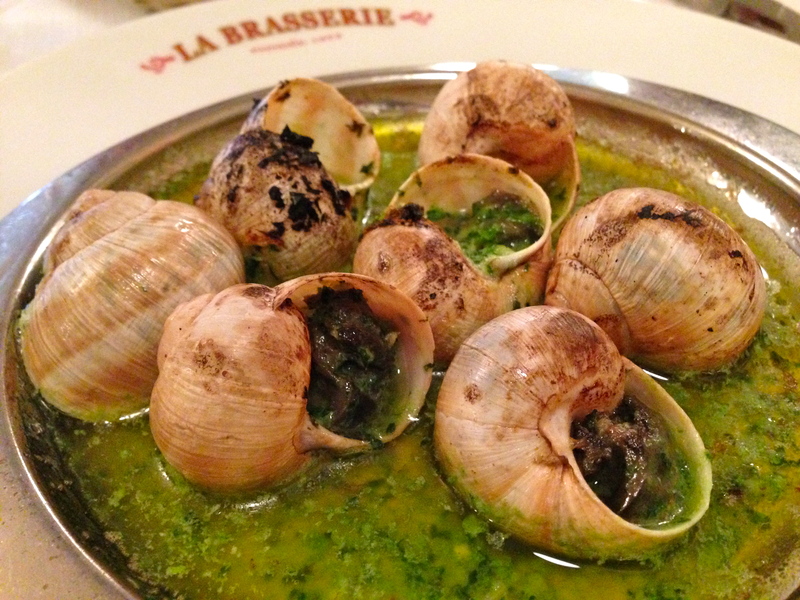 If you do dine at La Brasserie, tweet me pictures of your French feast @Alessandra_LDN. Go on, make me jealous. I had a fabulous afternoon tea there, I’m glad that you enjoyed it too!